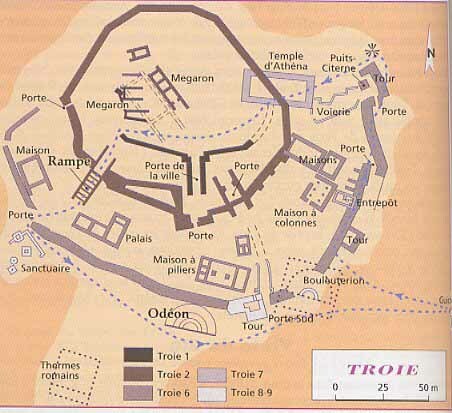 PREMIÈRE PARTIE — LA VILLE DE TROIE. CHAPITRE PREMIER. — LES FOUILLES DE TROIE. CHAPITRE II. — HOMÈRE ET LA VILLE DE TROIE. DEUXIÈME PARTIE — LA GUERRE DE TROIE. CHAPITRE PREMIER. — HOMÈRE ET LA PLAINE DE TROIE. CHAPITRE II. — LE PEUPLE DES TROYENS. CHAPITRE III. — LES CONFÉDÉRÉS HELLÈNES. - LES ALLIES DES TROYENS. - LES CAUSES DE LA GUERRE. CHAPITRE IV. — LA TACTIQUE ET LE PLAN DE CAMPAGNE DES GRECS DEVANT TROIE. - CONCLUSIONS.